First Round : Jeff Sluman at 7-under-par 65 led Rory Sabbatini by one and eight players by two strokes. Second Round : Sluman at 8-under par 136 led Lucas Glover, Nick O'Hern, Harrison Frazar, Jonathan Kayne and Tiger Woods by one stroke. Third Round : Sluman, Fred Couples, Bart Bryant and Daviid Toms moved to 12-under-par 204 to lead Woody Austin and Jonathan Kaye by one. Peter Lonard was two behind. Missed Cut: Jonathan Byrd (75-72-MC), John Daly (76-71-MC), Todd Hamilton (69-78-MC), Kevin Stadler (75-72-MC), Skip Kendall (72-75-MC), Mark Calcavecchia (73-74-MC), Steve Jones (75-72-MC), Shaun Michael (74-73-MC), David Edwards (75-73-MC), Bernhard Langer (74-74-MC), Toru Taniguchi (75-73-MC), Ted Purdy (75-74-MC), James Driscoll (76-73-MC), Fred Funk (78-72-MC), Brett Quigley (78-72-MC), Aaron Baddeley (76-74-MC), Rich Beem (72-78-MC), Frank Lickliter II (77-73-MC), Vijay Singh (77-74-MC), Davis Love III (78-73-MC), Craig Perks (80-71-MC), Pat Perez (75-76-MC), Mike Weir (76-75-MC), Arron Oberholser (77-75-MC), Jack Nicklaus (75-77-MC), Ben Curtis (78-77-MC). Weather: Mostly cloudy on Thursday with a high temperature of 70. Winds ESE 8-12 mph. Light drizzle off and on most of the day. Partly sunny and humid on Friday with temperatures reaching 77. Winds SED 8-12 mph. Mostly sunny on Saturday with a high of 86 with light S winds 5-10 mph. Partly sunny and warmer with a high of 88 on Sunday. Winds S 5-8 mph. Barton Holan Bryant entered the 2005 Memorial Tournament as perhaps one of the least likely players to emerge as its winner. Even tied for the lead heading into the final round odds makers would have been hard-pressed to put much stock in his chances to win his second career PGA TOUR event. Bryant - A 42 year-old career journeyman who waited 14 years and endured three surgeries before capturing his first PGA TOUR victory in what was his 187th career start at the Valero Texas Open in 2004. 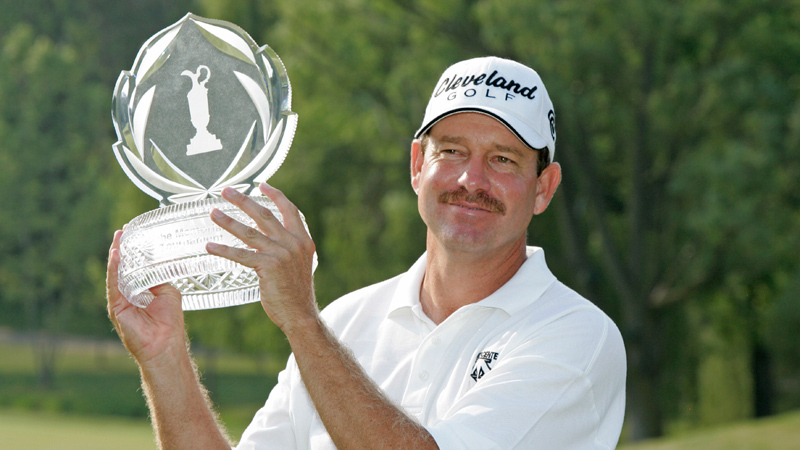 Upon entering the 2005 season, the native Texan had played only seven full seasons on the PGA TOUR since 1991. He bounced back and forth between the PGA and Nationwide Tours and completing five successful trips to Q-School during that time, earning just over $1.5 million for his career. He finished tied for 66th in his only other Memorial Tournament appearance in 1991. Fred Couples - A crowd favorite and 24 year TOUR veteran with 15 career PGA TOUR victories including the 1996 Masters and 1998 Memorial Tournament. He had recorded five top-10s at the Memorial Tournament over 16 starts and was 5th among the all-time Memorial Tournament money winners with more than $1.2 million. In his 20 plus years on TOUR he had more than $16.5 million in earnings, placing him 11th on the PGA TOUR career money list. Jeff Sluman - A steady competitor with more than 25 years of TOUR experience and six TOUR victories, including the 1988 PGA Championship. With more than $15.5 million in career earnings he was 16th on the PGA TOUR career money list entering the 2005 season. In his past 14 Memorial Tournament appearances he had recorded four top-20 finishes. David Toms - A 10-time winner on TOUR, including the 2001 PGA Championship he had earned more than $18.9 million in 12 years as a professional, placing him 8th on the PGA TOUR career money list. In 2004 he ranked 3rd in final-round scoring average with 69.40. He had only played in three previous Memorial Tournaments prior to 2005, finishing tied for 26th and 51st in 1992 and 1998 respectively and missing the cut in 1999. So, after three days of some of the most competitive golf the Memorial Tournament has ever witnessed these four contenders ended up all square at 204, 12-under-par with 18 holes to play, with only five shots separating the top-16. How would the final round play out? Who would you bet on to come away victorious?
. Would anyone have bet on Bart Bryant? Anyone...? Perhaps not even Bryant would have bet on himself. "Other people around me believed more than I did that it would happen, and luckily I kind of lived through them," Bryant said. "There's always been a seed of doubt in my mind that this would happen." Seed of doubt aside, Bryant stood over a 14-foot, downhill par putt on the 72nd hole of competition and calmly sunk it to finish with a 4-under-par 68 and a 16-under 272 total, bettering Fred Couples by one stroke to become the winner of 2005 Memorial Tournament. How did we arrive at this most unlikely and closest finish to the Memorial Tournament since Paul Azinger holed a bunker shot for birdie on the final hole to win by one stroke in 1993? Bryant recorded consistent first and second scores of 3-under-par 69 moving him steadily from a tie for 13th at the end of the first round to a tie for seven at the conclusion of round two. The outright leader of the first two rounds, Jeff Sluman, fired a bogey-free first round of 7-under-par 65 followed by a one bogey, 1-under-par 71 second round to enter day three leading by one stroke over the field. Two very familiar and popular names at the Memorial Tournament joined the hunt as round two drew to a close. Fred Couples recorded seven birdies in round two scoring a 5-under-par 67 to move him into a tie for seventh with Bart Bryant, Tim Herron, Steve Flesch and Stewart Cink. Moving into a five-way tie for second place with Lucas Glover, Nick O'Hern, Harrison Frazar and Jonathan Kaye was three-time Memorial winner Tiger Woods, recording his second round in the 60s at 4-under-par 68. Four players emerged at the end of the third round to hold a share of the lead at 12-under-par 204. It was the first time since 1981 that multiple players were tied for the 54-hole lead (that year none of the round-three co-leaders were able to hang on and win the Memorial). Making the biggest move in round three was David Toms, soaring up from a tie for 16th by carding a sizzling 64 that included two eagles, one of which was an ace on the par 3 fourth hole. Couples and Bryant both posted third-round scores of 6-under-par 66 with six birdies and an eagle and nine birdies respectively. Bryant's 66 was his third consecutive round in the 60s. Sluman maintained a share of the lead he had held outright through the first two rounds with a 4-under-par 68. Woods' round of three bogeys to only four birdies moved him out of a share for the lead and into a tie for 10th, four shot back, heading into the final round. Sunday at the 2005 Memorial Tournament welcomed unseasonably hot temperatures with highs close to 90 degrees, capping off a great week of beautiful weather at Muirfield Village Golf Club. With the warm temperatures the competition in round four heated up and what started as a four-man race ultimately ended as a two-man sprint to the finish with Bryant and Couples battling it out on the back-nine. As Bryant and Couples battled on the back-nine, Jeff Sluman and David Toms played themselves out of contention, unable to maintain the momentum they had gained entering the final round. Toms, who ranked No. 10 in the world entering the Memorial, never recovered from a three-putt bogey he suffered at the ninth hole. Subsequently, he bogeyed the 10th hole and dashed any remaining hopes of a victory with a double-bogey on the par-4 14th. "I didn't make any putts early (when) I hit a lot of good shots, Toms said. "I didn't capitalize on them. Then I hit some bad shots. I didn't recover. If I would have made any putts at all early in the round, I could have had a good day." Toms recorded his first top-10 finish at the Memorial, although his slid to a share of eighth place was undoubtedly a disappointment. Sluman's slid began in round three as he bogeyed three of the four par 3s. He offered up more of the same on Sunday, bogeying three holes on his outward nine and one on his inward trek. He was able to offset his four final round bogeys with four birdies, but a final round even-par 72 was ultimately not enough to overtake Bryant. "I was in there basically until I missed that (birdie) putt on 18," he said. "I've got nothing to complain about. I played well all week long and I'm feeling more confident with my putting and chipping and all that, so I see good things ahead. Sluman finished tied for third, four shots behind Bryant. With three straight birdies on holes 5, 6 and 7 Tiger Woods started his final round with a charge, cutting his four shot deficit to two. But then the 8th hole took a bite out of his charge as he double bogeyed the par-3, and although he birdied four more holes on the back-nine the double bogy had taken its toll. "That was just enough of a momentum-killer," said Woods. "If I'm hitting the ball well enough that I gave myself 18 looks at it, I'll make my share of birdies. I just didn't give myself enough looks at it, and I also made a couple mistakes in between." Woods finished the tournament tied with Sluman and Bo Van Pelt for third. Bryant and Couples waged a fierce seesaw battle that experienced eight lead changes before finally being decided by one stroke. The front-nine was a rollercoaster ride for both contenders, Couples with two bogeys to his two birdies and Bryant with three bogeys to his three birdies. And so it was that the two began their inward nine holes at the 30th playing of the Memorial Tournament all square at 12-under-par. Bryant struck first on the back-nine with a tremendous third shot into the par-5 11th hole that came to rest two feet from the cup, giving him a mere tap-in for birdie. In the final group of the day, immediately following Bryant, Couples answered at the 11th with a birdie of his own to regain a share of the lead at 13-under-par. Couples was next to make a move as he sunk a big 10-foot left-to-right breaking putt on the 12th hole for birdie. After Bryant's par on No. 12, Couples' birdie gave him the outright lead... for the moment. Both men pared the 13th hole and then Bryant dropped in a 20-foot birdie but on No. 14 to grab back a share of the lead. Couples however was not in a sharing mood and hit a very aggressive approach shot into an extremely dangerous back right pin position on No. 14 landing it 5 feet from the cup. His aggressive play was rewarded as he made his birdie putt to take back the outright lead at 15-under-par. Bryant fought back again on the par-5 15th, sinking yet another long birdie putt to move back into a tie with couples at 15-under-par. His share of the lead was to be short lived again as Couples launched his second shot on the par-5 15th to within 5 feet giving him an excellent opportunity to go two-up on Bryant. Couples missed the eagle putt, which would come back to haunt him in the end, but made his tap-in birdie to once again take the outright lead. After a birdie barrage that covered four of this first six holes on the back nine, Couples finally stumbled on hole 16 recording his first and only bogey on his inward run. As Couples struggled on No. 16, Bryant hit a wonderful approach shot into the 17th green that gave him a 5-foot putt for birdie that he calmly drained to record his fourth birdie on the back-side. Couples bogey on 16 coupled with Bryant's birdie on 17 produced a two-shot swing that gave Bryant the outright lead as he walked to the 18th tee. Bryant's resolve was to be tested on his 72nd hole of competition at the 2005 Memorial Tournament. His final tee-shot landed on the left side of the fairway and took a wicked kick to the left, coming to rest in an unplayable lie on the down slope of the stream that runs parallel to the 18th fairway. Without a viable alternative Bryant decided to take a drop, which would cost him a one-stroke penalty. At the time he held a one-shot lead over Couples who was staring at a good birdie chance on the 17th green. With his penalty assessed, and now hitting his third shot, Bryant took careful aim with a 7-iron, trying desperately to ignore the added pressure that the penalty stroke had added to an already critical approach shot. With the skill of a champion Bryant hit a solid shot that landed safely on the 18th green and gave him a chance to make a 14-foot par putt to remain 16-under. Meanwhile, Couples missed his birdie attempt on 17. As the ball left the clubface of Bryant's putter the gallery surrounding the 18th hole held their collective breaths. The putt started to trickle left when it reached the cup but had just the right line and speed to drop in. The gallery cheered as Bryant celebrated with raised putter his momentary retainment of his one-shot lead over Couples. "I knew it was a big putt, but I tried to but that in the back of my mind and focus on the putt itself," Bryant said. "I knew it was going to turn a little bit left, knew it was going to be extremely fast. Honestly, I was hoping to make the putt, but I can't say I was really trying to make it. I was trying to lag it down there. I knew Freddie was (one stroke behind) and I didn't want to do anything crazy and leave myself a 4-fotter coming back. Luckily, it had just the right line." Couples came to the 18th knowing he needed a birdie to tie Bryant. After a good drive he opted for an aggressive play that risked missing the green, rather than a safe one that may have had him looking down the barrel of a tricky 30 foot putt. He attacked the pin with his approach shot attempting to cut a 6-iron but his shot sailed into the rough, left of the green. "I figured if I hit it to the right (of the pin) there's no way I can make that putt. It was a bad spot," Couples said. "I was trying to hit a shot that would hold up into the wind and maybe be short of the hole," he said. "Instead, I hit it straight and it rode the wind left of the green... and left of the green is no good." Couples was faced with an impossible chip that sailed past the hole and ended his chance to win his second Memorial Tournament. Couples holed his par putt for a 69 and 273 total, one stoke off the lead. It was the second year in a row he finished second. "Bart has been through a lot," said Couples. "What a great victory. It'll be one he'll never forget." With the win, Bryant recorded the second PGA TOUR victory of his career. After waiting 18 long years for his first victory (2004 Valero Texas Open), he now had his second in just nine months. "I'm very blessed to win here," he said. "To win against a quality field like this on a great, great golf course... (and) walk off the 18th green and have Mr. Nicklaus waiting to shake your hand and congratulate you is beyond comprehension at this point."